Can the type of house one lives in help its residents live longer? The architectural team of Arakawa and Gins thought so. They believed in it so wholeheartedly that they gave their unique twist on design an equally unique name: Bioscleave. The first example in the United States is located in the East Hamptons, now on the market for $2.495 million. 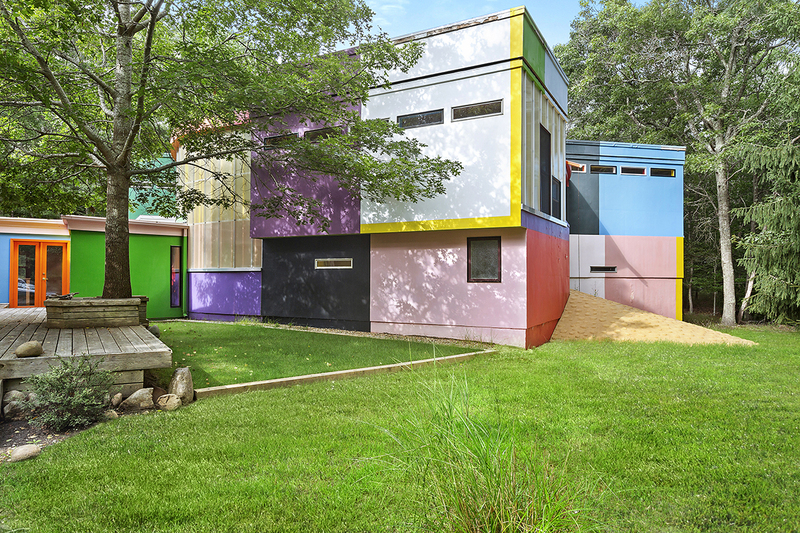 In their 2002 book ‘Architectural Body,’ Arakawa and Gins discussed their goals, which in lay terms translates to interactive, stimulating daily living in an environment where every action becomes important due to having to negotiate extremely uneven floors – with vertical poles to hold onto, windows at varying heights and walls unusually arranged that are dressed in 52 strong pops of different colors. The architects believed that the constant awareness of how one is using their body and senses can allow the body to constantly re-configure itself and eventually strengthen the immune system. Ideally these physical and sensory challenges and improved immunity would eliminate much of the deterioration of old age. Built as an extension to a 1964 A-frame house designed by Harvard architect Carl Koch, it is sited on one acre in the popular East Hampton community. The overall combined structure measures approximately 3,400 square feet with four bedrooms and three baths. The original A-frame is 900 square feet and is accessed in three ways, either by a corridor, a labyrinthine basement directly into the kitchen or through the two front doors that sit atop steep slopes. The 1999 Bioscleave addition measures approximately 2,700 square feet. The A-frame consists of a living room with fireplace, two bedrooms and two baths and a full basement while the Bioscleave addition contains the kitchen, two bedrooms, a bathroom, sunken kitchen and a raised dining area and work platform. The Bioscleave House, the culmination of 40 years of scientific and philosophical investigation into how best to sustain human life and how to use architecture to help people live exceedingly long lives, is priced at $2.495 million. Directions for use are included. The listing agent is Jose B. DosSantos of Brown Harris Stevens of the Hamptons.